After spending much of his youth in Liverpool’s Catholic seminary training for the priesthood, Vincent J. Miles embarked on a very different career path as a molecular biologist and biotechnology executive. He holds B.Sc. and Ph.D. degrees from University College London and is currently a venture capitalist in the Boston area. Boys of the Cloth is invaluable for many reasons. It provides the clearest, most concise and most accurate analysis and explanation of the relationship between seminary formation and priests who sexually abuse minors that I have seen. There are hundreds of books published about the Catholic clergy abuse issue. Many are very good. Some are mediocre. A few try to defend the institution and project the bishops' collective denial... and are a waste. Then there are a few that are foundational to understanding the length and breadth of this nightmare. This is one of them. Sexual abuse by priests continues to be a black mark on the Catholic church. 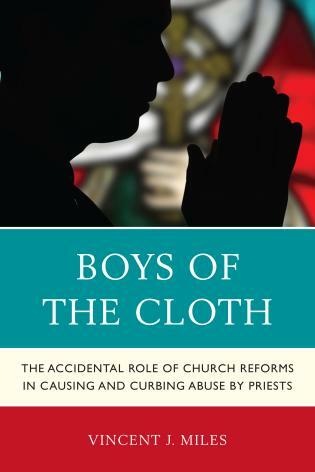 Boys of the Cloth: The Accidental Role of Church Reforms in Causing and Curbing Abuse by Priests analyzes the politics and policies of the Catholic Church over hundreds of years and how it is strong impacting in both directions the corruption of the church. Vincent Miles focuses on the 1960s, but takes notes on the modern situation as well as history to present a vivid picture of scandal and why it is happening. Boys of the Cloth is a strong addition to social issues and religious studies collections, highly recommended. A provocative contribution to the discussion about sexual abuse of children by priests, which raises many important points. Based on careful research, and on what he calls his ‘strange semi-monastic existence... as a teenage Catholic seminarian during the 1960s,’ Vincent J. Miles has penned a clear, well-written analysis of the sexual abuse epidemic within the Catholic priesthood. Miles deconstructs the simplistic view that explains away the epidemic as merely ‘a product of the Swinging Sixties,’ and looks at deeper causes within the culture of the seminaries themselves. Boys of the Cloth is a valuable contribution to our understanding of the psychopathology of sexual abuse, written from an informed and humane perspective. Drawing on the author’s unusual background as a seminarian turned scientist and business executive, Boys of the Cloth presents a unique analysis of the sexual abuse crisis in the Catholic Church. The book combines a first-hand account of seminary life during the 1960s—a period that turns out to be crucial for understanding the crisis—with explorations of the history of the seminary system, current scientific knowledge about abusive behavior, and the Church’s own investigations into the “epidemic” of abuse by its priests. Through the interplay between these topics, two paradoxical conclusions emerge. First, that the epidemic was caused by an ancient reform intended to eradicate rather than encourage clerical corruption. Second, that it was reversed by modern Church policies with no obvious connection to sexual abuse. Boys of the Cloth will transform your understanding of predatory behavior by priests and of measures that will be crucial to prevent it.